Forza Motorsport 7 gives off a great first impression. Professional drivers introduce you to the various disciplines of racing while you get to reenact the crowning moments of their career. The game gives you an allotment of “mods” to boost the credits you earn and the campaign mode’s first category briskly moves you along to make you believe this is going to be a high-octane experience. Sadly, that momentum lets up pretty quickly. While the actual race mechanics of this latest entry in Turn 10’s flagship series are stellar, the introduction of loot boxes and the decreased amount of credits offered really makes collecting cars a drag. 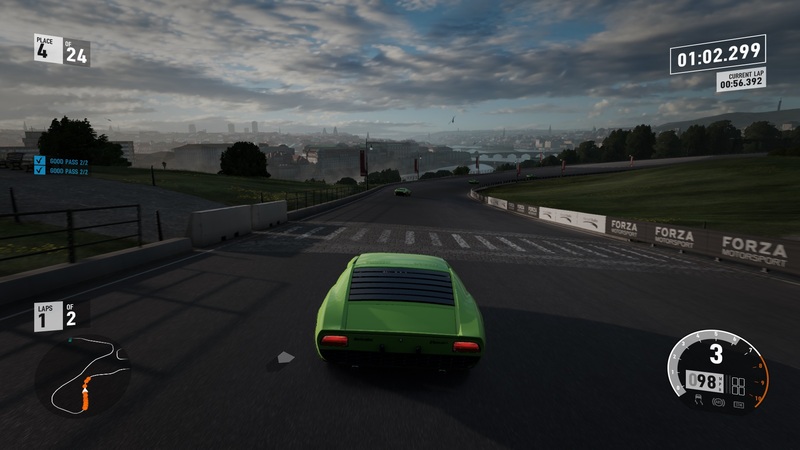 This is not the Forza we’ve always dreamed of, even if it is in 4K. From a purely gameplay perspective, Forza 7 is really solid. The handling model isn’t exactly realistic or strictly arcade style, but a nice balance between the two. Each player can take hours tweaking various mechanics from tire pressure to weight distribution, or you can just pick a car that looks fancy and take it to the track. 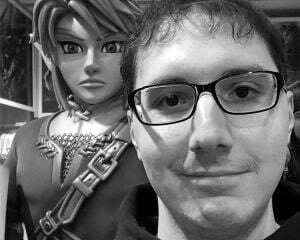 This is a game that can be as involved as you want or as hands-off as you need. The introduction of dynamic weather and time of day is also a big deal. 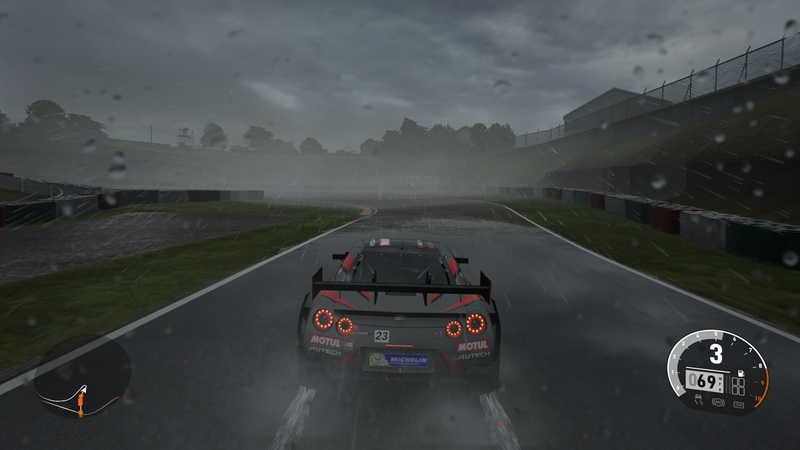 Most racing games give you static options for whether it’s raining or day time, but that isn’t always the case with real-life racing. Sometimes a downpour can happen right in the middle of a grueling endurance race and that doesn’t mean the entire race resets or stops. Forza 7 replicates that beautifully with rain that can start on the final lap or somewhere in the middle and even has water accumulate to cause further hazards. It’s a great element to keep longer races feeling interesting, since dialing in tuning options and basically sleep walking through 10 laps is pretty common in these games. Usually when you gain a huge lead, you’ll basically never see another opponent again (unless you lap them). Now, the dynamism offered from these new systems means you’ll have to be extra careful with your tuning to last. The best compliment I can give Forza 7 is that it is wildly customizable. There are so many options you can adjust that this game will be as challenging as you want it. If you want to make the campaign longer, why not adjust the race length to “Super Long” and go for 35 minutes? These options aren’t limited to the gameplay, either, since tweaking the look of your vehicle is practically a game unto itself. What really starts to impact the whole experience is how Microsoft and Turn 10 have needlessly and thoughtlessly introduced loot boxes. While microtransactions haven’t yet been included (even if they were present in the last few entries at launch), things have taken a considerable turn for the worse with these loot boxes. The biggest change is that racing assists no longer offer bonus credits, meaning your options for boosting your earnings are limited to AI difficulty, race duration, or loot boxes. Dubbed “prize crates,” these loot boxes will drop limited-use “mods” that will dole out bonus credits based on certain stipulations. Some of these will restrict you to particular assists (like “Brake Line Only” or “ABS off”) while most are simply win conditions (“Come in Top Three” or “Win by 50 meters”). While that is fine, in and of itself, the fact that these mods have limited uses or that the game pays you so little is infuriating. To test this theory out, I put myself up against the ultimate challenge in any racing game: an Endurance race. 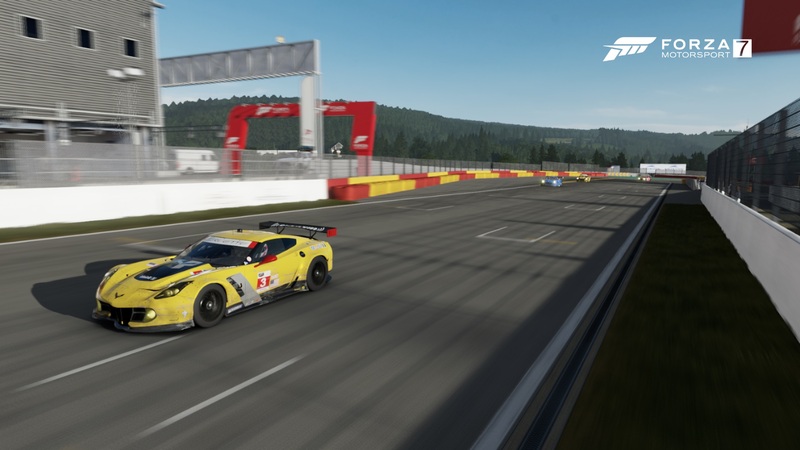 I selected one of the specialty events that limits mods and took a 23-lap race around Spa. It took me roughly 58 minutes to finish that race and I was awarded 190,000 CR, which is decent enough. With a few mods enabled on the next five race series, where each race was about four laps, I earned 200,000 CR in 20 minutes. That is asinine. It hampers the whole idea of even offering assists, since making the game challenging is basically for your own fulfillment. You aren’t going to be receiving a better payout, so why play without braking assistance or with full damage modeling turned on? You might as well put the damage on cosmetic, enable the new auto-driving function, and just hold the gas until you win. It screws up the balance of the campaign mode entirely. The awkward pacing of the whole thing doesn’t help matters much, either. I understand that there is only so much you can do to make a racing game ramp up in difficulty, but what happened to the alternative event types? Each of the six cups in the career mode has three special events and that’s it. The really fun “car bowling” game mode and the awesome “passing challenge” (where you’ll need to meet a quota of passes in a race) hardly come up and the track diversity is severely stunted. For a game that features 32 tracks and 200 configurations, why am I constantly racing on Brands Hatch and Spa? Even my beloved Sebring only comes up a few times and you rarely race the full circuit. The career starts to feel like Groundhog’s Day, where you’re either repeating the same track with more laps or just going through the motions for the umpteenth time. To really put the cherry on top, the gigantic roster of cars is actually locked behind different tiers. Through a car collector tier system, the more expensive and faster cars are all locked until you level yourself up by buying cheaper vehicles. I can understand the idea of wanting players to earn their keep, but with credits being dialed down so much, how am I supposed to save up enough credits to buy my Dodge Viper when I have to buy crappier cars to even unlock the ability? It seems needlessly obtuse and like its sole purpose was to push players towards microtransactions. 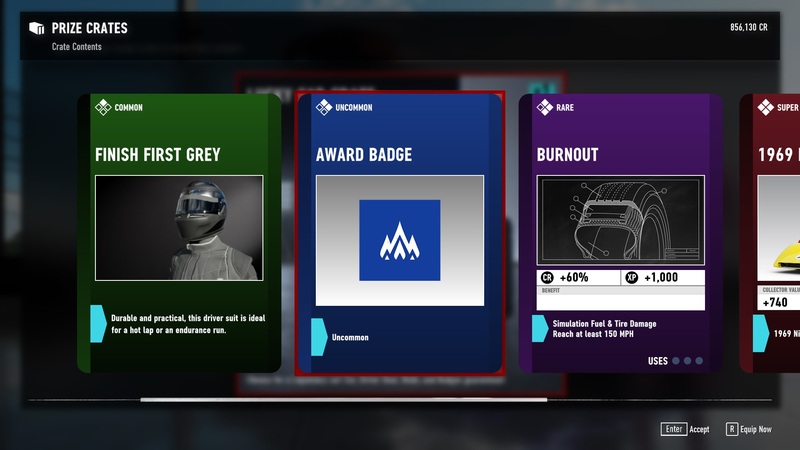 It doesn’t help that if you buy any of the currently available DLC, those cars are offered for free in game and boost your car collector score. If you ever wanted a clear example of pay-to-win, Forza 7 offers it on a silver platter. I have no idea why these changes were made, seeing as how they don’t make progression particularly engaging. For that matter, why is the auction house still not online? I also don’t even know what Forzathon is, since its option on the menu is plastered with a “coming soon” descriptor. Even if fans might argue that something like Forza 5 was undercooked, at least it launched with all of its modes available. These issues could be mitigated by the multiplayer if the previous iteration’s modes were included. I guess in an effort to really nail the cross-platform netplay, Forza 7 has an incredibly striped down online component. There are time trials and something called “Rivals” (which is essentially another method of time trials) and then just some generic options for lobbies that restrict play to specific car types. It's neato that there are 24 racers all going simultaneously, but what happened to things like “Cat & Mouse,” “Tag” or “Car Soccer?” Everything from the past installments is gone, which makes online feel like an afterthought. At least it runs really smoothly and the lobbies aren’t limited to strictly PC or Xbox One players. I honestly don’t even know how many people I met playing the PC version, but everything works without much fuss. I can also confirm that split-screen is limited to the console version of Forza 7, so all you PC gear heads will have to make due with online for your multiplayer fix. 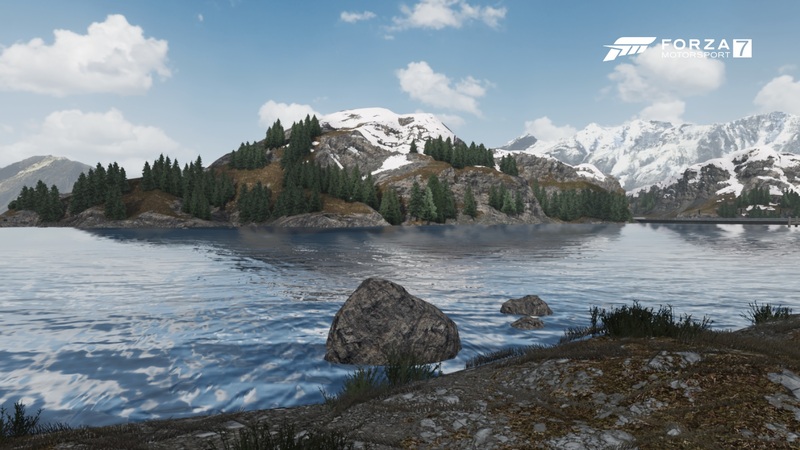 Graphically speaking, Forza 7 sets a new bar for fidelity. This is one gorgeous game, practically photo realistic in its presentation. While Xbox One players will be locked to 1080p, the PC version has the capacity to reach 4K resolution and it is mind blowing. You would be mistaken for believing this was a television broadcast of an actual event with how detailed it can be. That doesn’t mean oddities won’t pop up, as I did encounter weirdness with shadows bouncing around during night races, but Forza 7 looks like a hugely polished triple-A game. Its sound design is also just as superb, accurately taking engine noises and featuring full surround sound support. This is definitely a showcase game for your home theater equipment. For as spectacular as the whole endeavor might look, though, this mostly feels like an odd step backwards for the series. Forza 7 boasts the largest car and track roster of the entire series, but the subtle tweaks to the career mode feel like they were made in an effort to push people towards spending more money. While you currently can’t buy prize crates with actual cash (Turn 10 is looking to incorporate that in the future), the damage is done from their mere introduction. I really hope that Turn 10 takes an honest look at what these prize crates have done to Forza, since the game is otherwise solid. I would have an easier time accepting some flaws if I could make honest progress in the career mode or have a chance in hell of acquiring the cars in a reasonable amount of time. Instead, Forza 7 just makes me think of how much time I’ll be wasting and what else I could be doing instead of racing on Spa for the 90th time.